“Springtime in the Rockies” | Flickr - Photo Sharing! Picception images incorporate another camera or photo within your photograph. It can be a picture-in-a-picture style or something subtler like a photograph of someone taking a photograph. You may decide to photograph someone taking a photograph. Perhaps in camera techniques such as double exposure. If you still have a Polaroid camera & film, could be fun. Maybe post production using your favorite software such as Photoshop. I had a difficult time coming up with an idea that I was excited about this week – especially given the weather forecast. It was nearly 80°F (27°C) on Tuesday as we drove home from our first camping trip of the season and a blizzard warning was already in place for the next day. (A headline from a Denver station blared, “Temps to drop 60 degrees in 36 hours!”) So I decided to try combining the two weather extremes in a single photo for this week’s challenge. I hatched a plan to take a photo of our nearby open space as soon as we got home and repeat the photo the next day in the snow, but by the time all was said and done, I was on Plan D or E which involved a LOT of Photoshop. First off, I had hoped to find green grass in our valley to make it really feel like spring. Unfortunately, the green grass is only a couple of inches tall and is not very visible through the brown grass left over from last year. But it needed to be green for my concept to work, so I did my best to add the color in Photoshop. I had also hoped for a spectacular sunset to add color to my springtime photo, but the sunset was fairly muted that evening. I took a series of photos (like a time lapse) through the course of the sunset, so I played a bit with a time-stacking technique to add more color to my photo. The blizzard hit the next day and I wish I could report that I was a badass and braved the elements to get my second photo – but no, I wimped out. Truth be told, if I could have figured out how to keep the filter on my lens from gathering snow the moment I removed the lens cap, I might have tried. But the wind was blowing the snow every which way and I could tell from the way the snow was sticking to just one side of the tree trunks that I would have been pointing my camera directly into the blowing snow. I did not have much hope of success, so I didn’t even try. The snow had stopped by the next day and I decided to take another photo of the valley that evening (the same time of day as my first photo so that the lighting would be similar). Luckily the sky was mostly cloudy, so I was able to capture a scene with a moody looking sky. I had downloaded my “no snow” photo to my phone so that I could position it in the scene and line up the horizon lines. I had thought I might just use that for my picception image, but the image on the phone had an ugly greenish tint in the photo I took, so I ended up compositing the actual photo into my final image in Photoshop. I also found that the strong contrast between my black glove (and the black phone) against the white snow was too much for my camera to handle. If I exposed for the snow, my glove and phone were in silhouette. And if I exposed for the glove, the landscape was blown out to nearly white. Soooo, I decided to expose for the glove and then take another photo of the snowy landscape without my hand/phone in the photo so that I could composite them together in Photoshop. 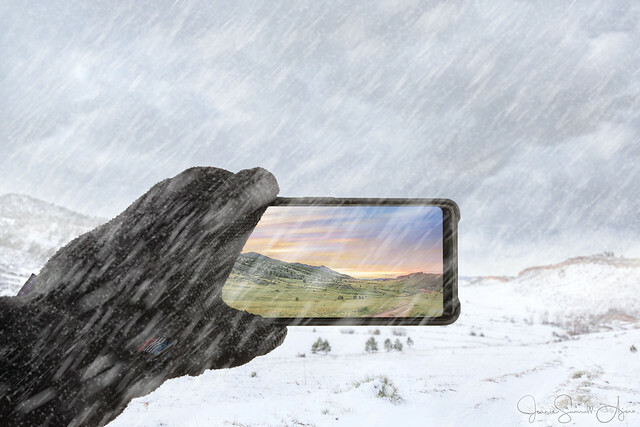 This left me with three images to put together in Photoshop: the no-snow landscape scene, my gloved hand holding my phone and the snowy landscape. The only thing that was missing was the snow! I had really wanted the feeling of being out in a blizzard. So I did a quick search and found this awesome tutorial: youtu.be/yP7qiZIuTA0 That tutorial is more for gently falling snow, but with a bit more motion blur I was able to create a blizzard effect. This challenge got me re-inspired to try time lapses. Now that it is starting to warm up and green up, I should have more opportunities to play with it and re-familiarize myself with LRTimelapse. I had never tried creating fake snow before. Now that I know how to do it, I can see adding it to some of my “birds in the snow” photos. Canon 5Diii, Canon EF24-105mm f/4L (at 24mm), 1/200 sec, f/11, ISO 100, RAW. Post-processing in LR and PS. Roi.C, 明遊快, Travlin/Cindy1, and 3 other people added this photo to their favorites. Great way to meet the challenge of getting the effect you wanted! I really love this image and the story it tells! Wow, you sure make things difficult. But you get great results Thanks for sharing your recipe, the tutorial about making snow and creating this interesting and unique composition.